Old Town San Diego State Historic Park - TourGuideTim Reveals San Diego! 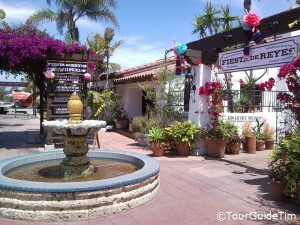 Old Town San Diego State Historic Park Highlights: As Mexico established independence from Spain in 1822, the area of Old Town came to life with an influx of immigrants. This growth continued through the Mexican-American War, after which Old Town San Diego became a part of the United States in 1848. Additional immigrants moved into Old Town until the late 1860′s when new development began to take place closer to the waterfront, which is now home to Downtown San Diego. 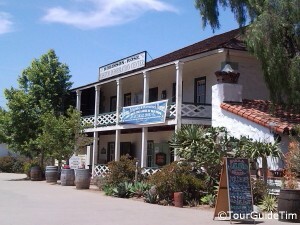 Old Town San Diego State Historic Park offers visitors the opportunity to see what life was like from 1821-1872. You will spend a fair amount of your time outdoors walking between historic landmarks and other attractions. With that in mind, you may want to skip the Park on the rare day it happens to rain in San Diego. For most people it is never too hot or too cold to keep you from visiting Old Town. Read our description about San Diego weather. On Wednesday mornings, volunteers create a ‘living history’ in Old Town. You will see them wearing period costumes, operating the wood shop, metal working shop, and more. During the school year, many classes are brought to Old Town. If you want to avoid these crowds, your best bet is to visit in the afternoon. Consider setting aside at least four hours to enjoy this park, which is on the National Register of Historic Places and includes 10 California Historical Landmarks. You will find several historic buildings including five original adobes, a printing press, and a school house. Look for a yellow brochure inside the entrance to each building. These brochures provide the story of the building you are entering and a description of each room. The McCoy House Interpretive Center provides a great historical look at the various eras in American History. You will follow a timeline throughout the house starting 20,000 years ago when Asians crossed the Bering Strait into North America. The exhibits then focus on the Kumeyaay Indians, who first ruled in San Diego, followed by exhibits on Spanish Rule, Mexican Rule, and then the early years of America. 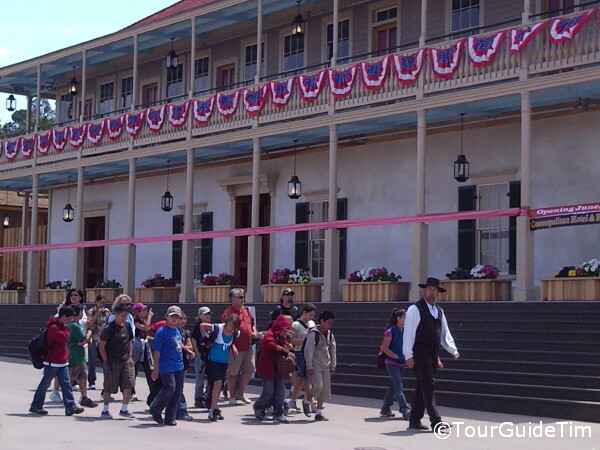 The exhibits covering the early years of the United States include stories about a conference in San Diego that established the international border from Texas through California, early traders in the region, and the large influx of eastern immigrants stopping in San Diego on their way to San Francisco to look for gold. (Traveling to San Diego allowed gold seekers to avoid crossing the Rocky Mountains.) The exhibits are engaging and will be attractive to visitors of all ages. It is very easy to miss the McCoy House Interpretive Center. You will find the back side of the Interpretive Center hidden behind the Visitor Center. The entrance on the opposite side faces the corner of Taylor Street and San Diego Avenue where there is no access because of a fence in the front yard. Plan on spending at least an hour in the house. 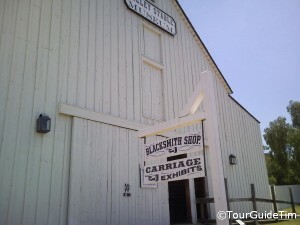 Seeley Stables Museum has one of the best collections of wagons and carriages you will find anywhere. Plan on spending an hour looking at two full floors of wagons and carriages as well as a Blacksmith Shop and Wood Shop in the back courtyard. Two of the more notable artifacts includes Wells Fargo stage coaches that were used for difficult travel through the mountains and desert. The Wells Fargo Museum shows off an original Wells Fargo stagecoach in mint condition and gives a rare look into the history of the Butterfield Stage Coach Trail. The Butterfield State Coach provided the only practical way to carry money, news and mail from the East to the West Coast during the Gold Rush. It will take about an hour to enjoy this museum. You will find several specialty shops and Mexican restaurants throughout the Park. The terrain is flat and offers plenty of sidewalks and open lawns. Old Town State Historic Park Map – Get an overview of Old Town San Diego State Historic Park with this printable map from the Park web site. Old Town State Historic Park Brochure – Provides an overview of life in the mid-19th century Old Town and includes sectional maps of the Park that are a little bit easier to read than the one-page map noted above. Visitor Center / Walking Tours – You will find Park Rangers available to answer questions in the Visitors Center. They offer free tours at 11AM and 2PM each day. (Check for additional times that may be available on your day of visit.) There is also a large model display of what Old Town looked like in the mid 19th century. You will find four stations around the display, each providing a description on about a dozen homes in the model display near that particular station. Boosters of Old Town – Old Town is Free for Visitors. Although a portion of the money spent at restaurants and shops goes to the State of California, only a small fraction of these funds find its way back to the Old Town State Historic Park. If you would like to directly support the activities at Old Town to improve signage, brochures, and educational activities, you can make a contribution to the non-profit, Boosters of Old Town. Food – There are good Mexican restaurants on the grounds of Old Town State Park. It is a perfect place to catch a sit-down lunch or dinner after enjoying the attractions. You will find many more food options within walking distance. Many are on San Diego Avenue and include full service and fast-food Mexican, Italian, and general American fare. You will not find any national chains.